I’ve use a lot of applications to try and improve the state of my ridiculously over-sized music library. Some have been better than others, that’s for sure. Over the last while I’ve been entirely falling back on a Russian developed application called TagScanner. It’s solid, dependable, doesn’t attempt to offer any crap-ware on install, receives a reasonable amount of updates (which work well! 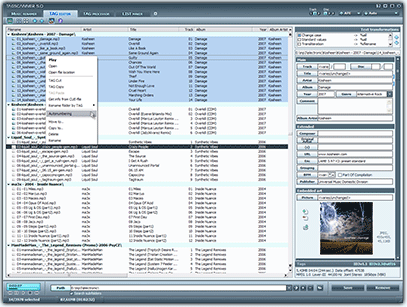 ), and it allows you to happily tag every different sort of music file you can think of with pretty much any or all tag types. So whether you prefer mp3, OGG, or FLAC, TagScanner will do the job. You can search for matches in FreeDB, Discogs, Amazon or TrackType.org which means you’re definitely going to find a match for most albums in existence. Did I forget to mention the best bit? It’s free! This also means that you’ve got access to a huge range of sources for album covers, letting you embed the album cover into each file as well as giving you the option to save a copy of the album cover locally. Finally it also includes something I consider to be important – the renaming of actual file names in whatever format you choose. So, once I’ve gotten the correct tags for said album I just switch to the “Music Renamer” tab and using “%artist% – %album% – %track% – %title%”, I rename all the files. This keeps things, somewhat anally, neat in my filing system and also means that if I’m searching for music files through the OS rather than a music library, I can easily find what I’m looking for, it also means if something accidentally gets misplaced, I can track it down.